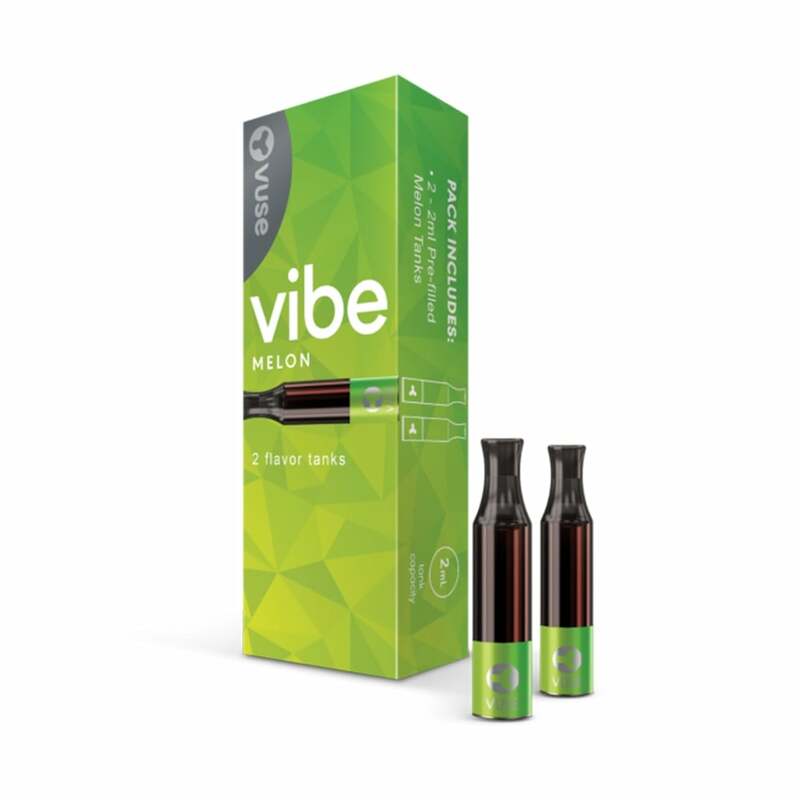 This is the fruity melon flavor in a pre-filled refill tank by Vuse. Refreshing and offering that perfect balance of sweet and sour, each Melon Flavor Pre-filled Tank is a true fruit explosion and captures that melon flavor perfectly. The Vibe is a new and innovative e-cig design by Vuse that uses an easy screw-on system to swap out pre-filled Vibe tanks. These Melon tanks are one of five flavors to choose from and you can easily switch between flavors too. I love this flavor. I'm so glad the Vibe is back. This is the pen that made me quit smoking almost two years ago. One thing. you list the cartridge as being 2.4 % when the Vuse website says it is 3.0 %. You may want to change this. For anyone who’s wondering like me when the Vuse vibe cartridges are coming back, I emailed a different website not electronic tobacconist and they relied “ Vuse Vibe is now discontinued and will no longer sold ”. Not sure if this is 100% true but wanted to share the info. Also fyi you can refill these with your own e juice. Found many videos on youtube and is what I’ve been doing since. When will you be bringing back all these vuse re-fills. The melon are my favorite. Please advise when you will be bringing them back. Excellent service!! Hope to see a restock of the Vuse Melon Vibes shortly!!! Taste good and always delivered on time. As the recall for the Vuse Vibe pens have initiated. Vuse says to keep your cartridges because they plan on re-releasing the Vibe. There's no recall on the tanks so, I don't know why everyone has returned them also. But, I sure am glad you get then in stock every now and then. I buy as many as I can. The melon is the best flavor for Vibe's. Keep them coming. They sell out fast. And of course, fast delivery as always. thanks! Really love this company! Thank you all for being so wonderful and easy to do business with!!! 5 Stars is not enough to express how wonderful this company is! You won't regret purchasing anything from them and no worries about when it will arrive as they stay in contact as well as update you via tracking number on the location of your items! Very Fast Shipping and wonderful customer service! Electronictobacconist is ABSOLUTELY the BEST! Wide range of products, FREE SHIPPING $20 order, Speedy Delivery, EXCELLENT price! What else could you ask for? I immediately contacted my sister & she jumped on the site. Kudos to you all!!! Tastes good, the tanks last me about 3 days. Not as cheap as buying single e-liquid bottles, but it's still a relatively good deal. Love this flavor! Great price. Free shipping and great customer service! Melon Flavor is my favorite of all the other flavors that the vibe makes. I Love them. Its melon flavor is awesome and smooth. I have tried almost all of the flavors and I always go back to this one. I would give this company 10 stars if I could!!! Super fast shipping! They give discounts! Doesn't get much better than this! Thank you all at Electrictobacconist!!!! Fantastic flavor. I quit smoking with this flavor of Vuse. The Vuse Vibe was the pen that I stopped smoking with. Too bad they were recalled. Excellent!!!! Will definitely order from this company again!!!!!! Thank you! Great customer service and prices. I have given numerous friends the website to purchase Vibe tanks.